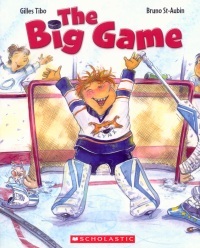 Notable children's writers/illustrators Gilles Tibo and Bruno St-Aubin have teamed up to give us the new hockey themed children's book The Big Game . It's a beautiful book with a nice story - kinda Robert Munsch-like. 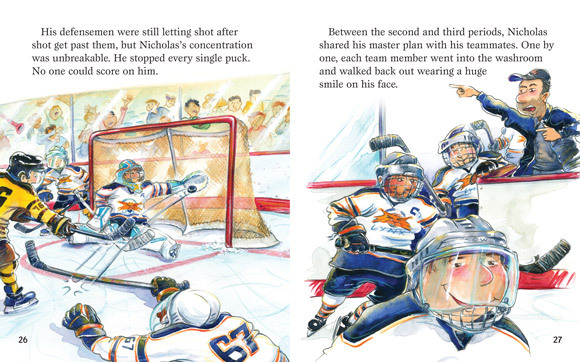 Between periods, Nicholas comes up with an ingenious plan to save the day — and stop every shot on goal! When he shares his winning strategy with the rest of his team, they can't help but come out on top. Gilles Tibo is a compulsive writer. As one of Canada's most important authors and illustrators he has penned over 160 children's books. He is a two-time winner of the Governor General's Award and the Mr. Christie's Book Award, and a two-time nominee for the Hans Christian Andersen Prize. He lives in Montreal, Quebec. Bruno St-Aubin works on his art from his home studio. He has illustrated over sixty children's books, and his favourite activities when he is not illustrating include soccer, cross-country skiing, cycling, jogging and playing hockey. He lives in Quebec.